This is a Buddhist temple of historic value and one of the few ancient structures sculptured from rock. The temple is famous for its Kandyan era frescos. The temple is located in Amunugama, Kandy Sri Lanka. This is only a maximum 28-minute drive away from the Kandy city, thus is easily accessible by tourists seeking accommodation in any hotel in Kandy including centrally located properties such as Kings Pavilion Kandy. Construction of the temple began before 1782 AD during the reign of King Kirti Sri Rajasinha, by his younger brother, Prince Rajadhi Rajasinha . The structure was completed after he claimed the throne after the king’s death. The temple grounds are about 40 ft big and are sheltered by rocks and composed of wooden roofs. The inner temple walls are filled with murals. The main shrine room is cut into the rock itself. 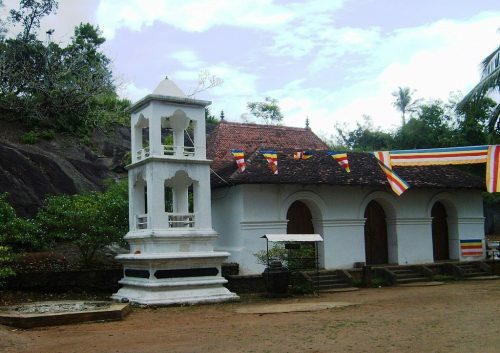 Similar to most Sri Lankan temples it is composed of a shrine room, a drumming hall, an image hall, and colourful murals. The image room is home to a moonstone and a variety of paintings depicting jathaka stories. The shrine room is the main worshipping area featuring an image of reclining Buddha. Next Post Exploring the best of Europe’s most scenic capital – your tour guide to Lisbon!